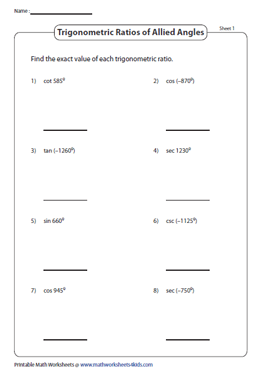 Allied angles worksheets feature topics like finding the exact value of the trigonometric ratio offering angle measures in degrees or radians, evaluating trig ratios of allied angles and proving the trigonometric statements to mention just a few. Precede your practice with a thorough knowledge of quadrants, degrees and radians from the ASTC chart included here. 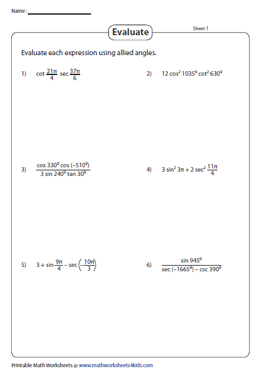 Explore the worksheets here containing skills to find the value of trigonometric ratios of angles presented in the form of degrees. Make use of the allied angle chart in degrees to complete the exercises. Employ the allied angle chart in radians to assist in determining the value of trigonometric ratios of angles given as radians, in the worksheets compiled here. 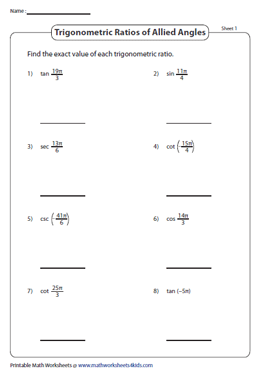 Incorporate these worksheets with a mixed bag of degrees and radians to evaluate trigonometric ratios of allied angles. Serves best in recapitulating the usage of allied angles. 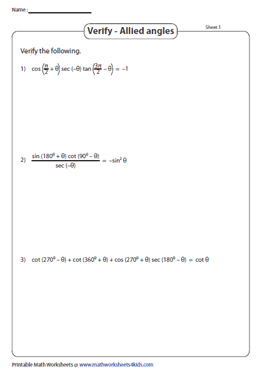 Prove the given trigonometric expressions by simplifying them using the allied angles and trigonometric identities in the PDFs enclosed here.